The preferred method to contact support is through email correspondence through your panel. 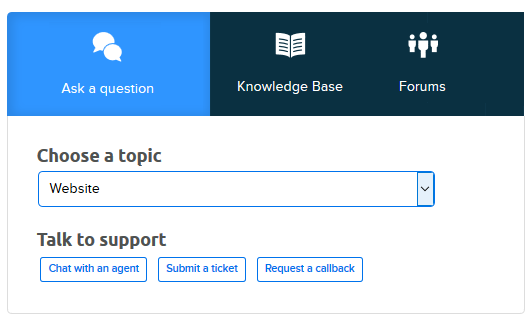 Support is able to answer most questions you may have and also provide you with links, examples, and so on that assist you in diagnosing an issue you're experiencing. Navigate to the Contact Support page. Click the 'Ask a question' box. Click the Submit a ticket option. Enter a descriptive subject and message that describes your issue. Always include your domain name (website name). 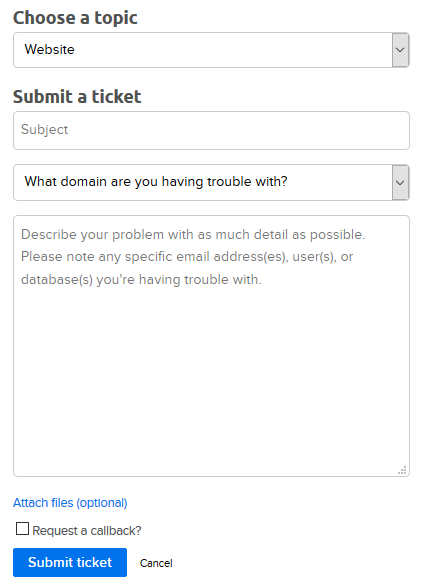 Domain issues – Describe in detail what the issue is. Try to include specific details so support is able to pinpoint the issue faster. Email issues – Include the email address with which you are having a problem. Login issues – Send the username and last two characters of your password you are using so support may verify if the credentials are correct. Database issues – Confirm which database is experiencing issues. Billing – Include which credit card, dates, amount, and any other details. Abuse – Include the address of the material in question. Please remember that support strives to answer all emails within 24 hours, and most are answered in substantially less time. If you don't already have an account with DreamHost, please use this contact form instead. If you would like to attach an image or file with your support request, you must submit your ticket in your DreamHost panel. The last page of the submission process allows you to add an attachment. Attachments cannot be sent directly through email. The DreamHost system strips all attachments out if the ticket is not submitted through the panel. If you are already a customer you can upload the file via FTP to your DreamHost server. When submitting your ticket, make sure to explain exactly where you uploaded the file.